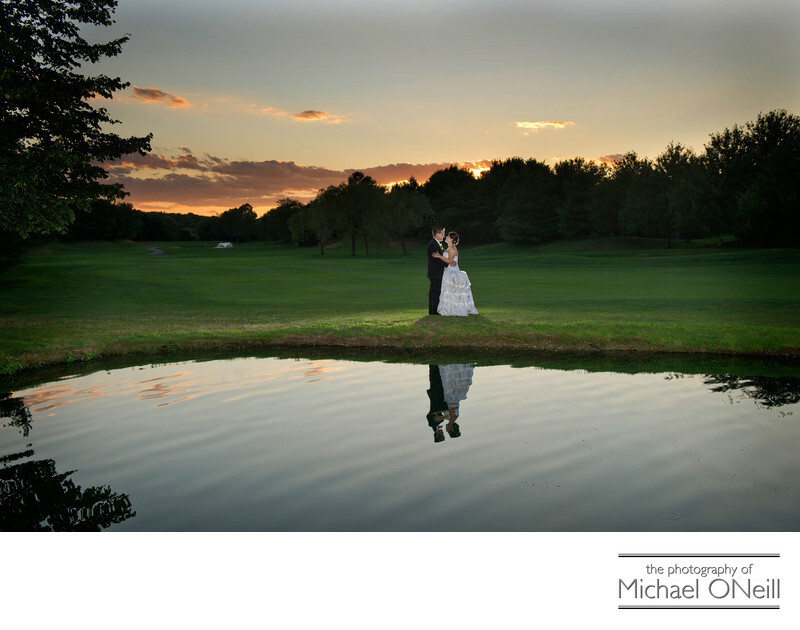 This beautiful sunset photo of the bride and groom was taken right outside the doors to their reception venue, The Hamlet Golf and Country Club in Commack, New York. The Hamlet, once home to the Hamlet Cup Tennis Tournament, is located less than 10 minutes from my East Northport, NY studio and gallery. I have had much experience creating great wedding photographs at The Hamlet over the years. The sunsets over the golf course can be breathtaking and the interior of the venue is equally beautiful. A two story tall lobby, with a gorgeous fireplace and a wrap around balcony has access to a wonderful bar area and a large bridal suite where you and your bridal party can relax and enjoy their fine food. When you and your spouse are introduced for the first time as husband and wife it will be in a huge ballroom that can easily accommodate very large parties. The Hamlet Golf and Country Club has got to be one of my favorite Suffolk County, Long Island wedding reception venues. Two other great wedding celebration venues on Long Island also fall under the ownership of ClubCorp. They are the Hamlet Willow Creek Golf and Country Club in Mt. Sinai, NY and The Hamlet Wind Watch Golf and Country Club in Hauppauge, New York. Being a Long Island based wedding photographer has afforded me the experience of working at all three of these fine establishments. If you are planning an event at any of these great wedding venues give me a call. I would love the opportunity to discuss all your plans and wishes for your big day.